Our silly blog is now available at the above address, supposedly. Sorry it took so long. This entry was posted in LAF on August 29, 2008 by live apt fire. At the risk of overanal yzing, the fact is this: Our subject, Mr. Mark Winne of WSB, would have had to deliver a resounding, high decibel blast from his nether region in order for the audio to reach his chest-borne lavalier microphone with such splendid clarity. And while we’re confident Winne has such capabilities, this smells of high mischief to us. Or, some audio glitch that reverberated from the control room when Winne’s package abruptly dumped. So to speak. An LAF reader alerted us to this a couple of weeks ago, claiming this is how it sounded on TV. The same reader directed us to the video this week— motivated, no doubt, to clear the air. By the way, youtube is filled with such stuff, with noises obviously dubbed into the delivery of live TV. But this one appears irrefutably to be the real deal. The host’s recovery is as splendid as her couture. Happy Labör Day. Viva Sweden. This entry was posted in winne watch, WSB on August 29, 2008 by live apt fire. The producer of WAGA’s 6pm news yesterday must have entered the control room uneasily. Instinct must have said: Lead with weather. But the luck of the draw gave Deidra Dukes a live window from Denver at the top of the broadcast. WAGA apparently had little choice– lead with the Democrats. Dukes’ lead live shot was perilous. It appeared she got last-minute instructions to toss to a vo/sot on Hillary Clinton releasing her delegates. Dukes couldn’t hear the tape and apparently had trouble hearing the cues from the control room. It was a raw moment. But Dukes recovered and tossed to an interesting package about Jimmy Carter, who recalled the disunity of the 1980 Democratic convention. Then WAGA got lucky. 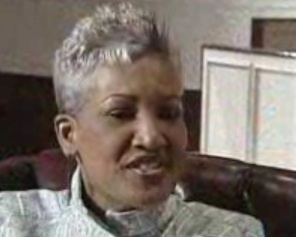 As Dukes concluded her live shot, Shirley Franklin answered the roll call for Georgia, and the station took it live. Note to reporters in Denver: Calling it “the DNC convention” is akin to referring to an “ATM Machine.” Yes, DNC actually stands for “Democratic National Committee.” But so many news folk are using DNC to abbreviate “Democratic National Convention” that it makes sense to steer clear of this appearance-of-a-redundancy. Call it “the Democratic Convention.” Or the “Democrat Convention” if you want to show your Republican leanings. Then WAGA launched into weather coverage. Charles Molineaux covered the tornado damage in Commerce without a wireless microphone. Molineaux’s mic wire draped awkwardly through some of the video. It doubtless hindered his ability to talk to newsmakers and communicate with his photog. If a wireless mic is in the shop, there ought to be spares. No big-market crew should be covering a big story with that handicap. The I-Team’s Randy Travis had a killer follow-up story on another craven, money-grubbing religious figure, a Gwinnett Hindu Swami who hilariously calls himself “Doctor Commander.” Yet it appears the slippery target of Travis’s report has eluded an on-camera confrontation, an I-Team signature. How’d that happen? There wasn’t room for much else at 6. Mo Diggs covered a downtown shootin‘. Portia Bruner did a tornado sidebar. Doug Evans delivered a too-long report on the capture of a fugitive. A nine-year-old took Amanda Davis’s vital signs (with the help of an EMT) during a too-long Wednesday’s Child segment. Then the show returned to Denver, just in time to hear Hillary Clinton ask for Barack Obama’s nomination by acclimation. Unfortunately, viewers had to sit through the New York chairman’s windy introduction of too-many NY elected officials before introducing Clinton. It added to the drama. But we can picture the 6pm producer yelling at the monitor to hurry it the f*%# up, while killing story after story from the rundown. This entry was posted in WAGA on August 28, 2008 by live apt fire. The good news: WSB is staffing the Democratic convention in Denver. The station sent anchor Monica Pearson and political reporter Lori Geary. More good news: Pearson apparently team-covered a meeting of the Georgia delegation with Geary in what appeared to be a hotel ballroom. It’s always refreshing to see Atlanta’s premier anchor/diva in the trenches slinging a stick mic. Pearson’s soundbite with Rep. David Scott appeared in Geary’s piece about the delegation’s desire for unity surrounding nominee-to-be Barack Obama. Unfortunately, Geary’s piece was predictable and leaned heavily on video of a hotel ballroom meeting. She redeemed it somewhat by disclosing that Labor Commissioner Michael Thurmond and House Minority Leader Dubose Porter are considering runs for Governor. Meantime, Pearson delivered a piece on Rev. Cynthia Hale, the Decatur pastor who gave the invocation Tuesday. Shot in Decatur prior to the convention, Pearson’s piece was also predictable. 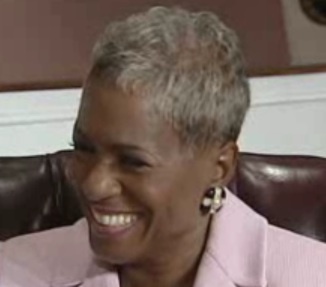 Hale, like Pearson, is a smartly-coiffed middle-aged African American woman. Their dueling hairstyles gave the piece a “whoa!” factor otherwise lacking. Give WSB’s management credit for recognizing that this year’s DNC is a high-interest story and a welcome respite from the drumbeat of weather coverage. Give its staff in Denver a little encouragement to actually come up with some high-interest material. This entry was posted in geary lori, monica pearson, WSB on August 27, 2008 by live apt fire. It’s a bad week to be Denis O’Hayer. WXIA’s political reporter is a smart guy. He’s a good reporter. He’s got good connections. 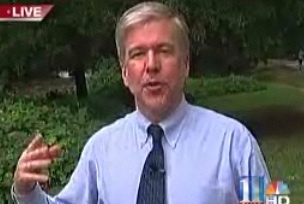 He’s one of the best reasons to watch WXIA. O’Hayer ought to be in Denver, giving WXIA some local color from the Democratic convention. Instead, he’s home. And adding insult to injury, this talented reporter spent today’s noon news producing a live report on a tree that fell on a house. The tree injured nobody, though a college-age woman who “could have” been in the damaged bedroom wasn’t. O’Hayer did it gamely. In his report, he spoke at some length about the root structure of the old tree, which had been compromised by excess rain. He sold the story as a Big Deal, even though it could have been adequately covered by anchor v/o. Selling such tripe is a TV reporter’s job. There’s no quicker way to get a phone call from the boss than by downplaying an a-section story as no big deal. Meantime, while he’s at the latest weather mini-event, O’Hayer is encountering his colleagues and competitors. At each turn, O’Hayer is doubtless hearing the same question repeatedly: Why aren’t you in Denver? It is probably driving the TV and radio news veteran batshit crazy inside. Sure, the national political conventions are hackneyed and stage-managed. Sure, local coverage doesn’t add that much. But we’d much, much rather watch O’Hayer face that challenge than see him take on a downed tree. Adding to his misfortune is the fact that WXIA has extensive coverage from Denver on its website. It is touting blogs from TV reporters based at Gannett stations in Buffalo and Denver, who are covering the convention. Too bad O’Hayer isn’t one of them, though he’s still blogging about politics. It shows where his heart is while he’s standing outside talking about a downed tree. Next time you see O’Hayer, our suggestion: Don’t ask him why he isn’t in Denver. A word of sympathy would sting much less. This entry was posted in o'hayer denis, WXIA on August 26, 2008 by live apt fire. In the grey box to the right, you’ll see “Please see full film @ …” and it’ll send you to a UGA website. Go there, and a full four and a half minute clip will play– excerpts of a debate between mayoral candidates Maddox and Ivan Allen, with Maddox sarcastically beating the drum for segregation. The clip plays as it aired in the film chain at the TV station. You hear sound, then the film goes silent as the reporter or anchor read narration (you don’t hear the narration). Then you hear sound again. In the Allen-Maddox clip, the best sound is at the end. In it, Maddox says, if elected, he would “say Ralph, go on back to Forsyth St. with all deliberate speed, boy.” Presumably, he’s talking about Ralph Abernathy. One can somewhat browse the UGA site here. It’s not terribly user-friendly, though. But it’s a rich find. Click here, and you’ll see a 1966 protest at the Capitol after the House refused to seat Julian Bond. Martin Luther King Jr. gives a stirring speech near the Tom Watson statue, with dozens of jacked-up state troopers standing in the wings. For camp value, click here. A reporter named Joel Abrams delivers a 1968 report on a UGA protest encampment called “persecution city.” Abrams appears to be a little embarrassed by the whole thing. It seems WSB covered numerous protests back in the day, when an assignment editor would hand 100 feet of film to a news crew and tell them to return in time for film processing and hot-splice editing. WSB was the only Atlanta TV station to save its film stock, handing it over to UGA for archiving and safekeeping. UGA makes copies of the film readily available, including to WSB’s Atlanta competitors. The web site says the WSB archive covers material from 1949 to 1981. Eureka. This entry was posted in WSB on August 24, 2008 by live apt fire.